Big tires and high ground clearance—this is the Jeep Safari concept that FCA unveiled today at the Easter Jeep Safari event in the Off-Roading Capital Of The World, Moab, Utah. It’s absolutely rad, but don’t be distracted: we could very well be seeing bits and pieces of the 2018 Jeep Wrangler here. 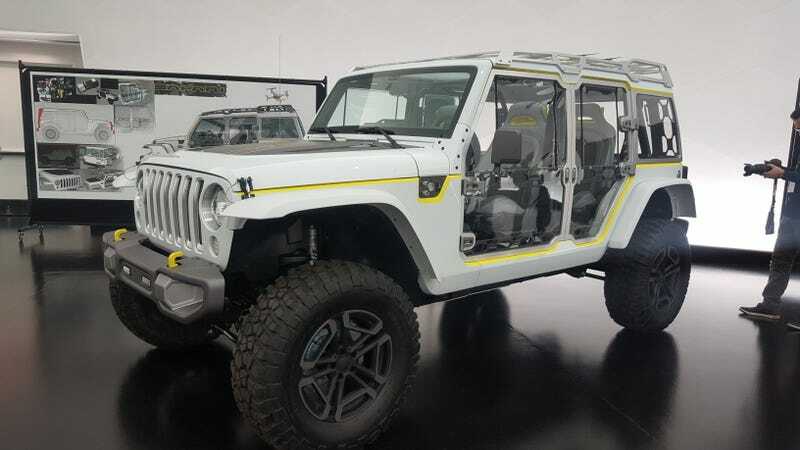 So far, we’ve only seen renderings of the new Wrangler, but there has been chatter about the off-roader’s removable doors and roof, which this concept certainly looks like it has. Glass doors that come off! What a thought. Also, notice the roof rail and how it looks solid. A thread on JL Wrangler Forums discusses how the new Wrangler could have a three-piece hardtop roof. From the outside, the Safari’s bumper, grille, hood and wheels are different from the previous Wrangler. Those seats look uncomfortable as hell, though. And it has a built-in air compressor! It’s tough to say what’s underneath the cosmetics, though. It’s unclear what sort of drivetrain and mechanicals lurk beneath this concept’s skin. If I were Jeep, I would build this thing on the new JL platform, but we don’t know for certain. It sure looks like it gives up some of the 2018 Wrangler’s cues, though. That grille!